In late March, after a four-year, American-backed operation, coalition forces finally drove the Islamic State militant group (ISIS) from its final patch of territory in Syria. The bigger challenge, however, will be ending the ongoing civil war and rebuilding Syria to bring home millions of refugees and internally displaced people. This means creating a state that can provide safety, security, and opportunity that forestalls further rebellion and devastation. It's a daunting task, unlikely to happen anytime soon. The nature of Syria's government and the likely shape of any war accords portend an empty peace, if not a frozen conflict, and years of further suffering, potentially fomenting further conflict in the region and providing a continued haven for terrorists. The cost of the Syrian civil war has been immense. Almost half a million people have been killed, half the population has been displaced, and the cumulative loss to the gross domestic product from 2011 through the end of 2016 has been estimated by the World Bank to total $226 billion. As yet, there have been no definitive estimates of the cost of reconstruction, although the Syrian government wishfully has mentioned $400 billion. Yet the territorial defeat of ISIS is not the end of the U.S. mission in Syria, where today some 2,000 American troops help the SDF administer and control the northeastern third of the country. Although U.S. President Donald Trump announced in December 2018 that he would be withdrawing all American forces from Syria, he has since partially reversed course—in March, Trump affirmedthat he is “100%” in favor of leaving a residual presence of 400 U.S. troops in Syria. As foreign fighters poured into Syria over the course of the civil war, they brought with them the technologies and know-how to conduct tunnel warfare. Members of the Islamic Stateand various rebel militias became experts of the practice, but in doing so they also made experts out of the Syria army, which had to learn the trade to counter its enemies. Soldiers loyal to Bashar Assad can now dig high-quality tunnels at various depths and in various conditions. It’s something Israel may want to keep in mind as it pushes a “safe zone” farther into Syrian territory. Assad has more or less come out on top in the Syrian civil war, but the war has exhausted his forces, and though he may not be looking for a fight, he at least has a new tactic at his disposal, one that Hamas and Hezbollah have shown to be effective. Here, we take a look at some key examples of tunnel warfare in the Middle East and North Africa. (FPRI) — After years of aerial bombardment by coalition forces and intense ground battles fought by U.S.-backed Syrian Democratic Forces, the Islamic State in Iraq & Syria (ISIS) has been ousted from every inch of territory in Syria. Although analysts are right to caution that this does not mean the threat from ISIS has been eliminated altogether, the collapse of the physical ISIS caliphate nonetheless marks a significant military accomplishment and transition point for U.S. strategy in Syria. U.S. policymakers cannot afford to rest easy. Transforming this military victory into a durable and successful political outcome in Syria calls for a fundamental re-assessment of where U.S. strategy and been and where it needs to go. Unfortunately, America’s broader strategy for Syria has lacked clear attainable political objectives and has suffered from the absence of a longer-term vision for the future of Syria. In the Syrian civil war, combatants are not always divided along clear lines, making it more difficult than ever for conventional forces like the U.S. military to combat pockets of insurgency. Amid the U.S. drawdown of forces from Syria, Turkey is gearing up for further incursions in the country to reduce the power of the Syrian Democratic Forces. Residual U.S. and allied forces will remain, however, raising the risk of a miscalculation or confrontation as Turkish forces push into the area. Despite improved ties with Russia, Ankara will also have to contend with Moscow's opposition to Turkey's full ambitions in the country. With the United States on the cusp of a significant withdrawal from northern Syria and Turkey continuing to court better relations with Russia, Ankara is gearing up to cross its southern border to pursue its cherished goal of taking on the Syrian Democratic Forces (SDF). But even as Turkey might soon enjoy clear sailing into northeastern Syria to seek to drive the SDF away from key positions, particularly around the Euphrates, pitfalls remain. From remaining U.S. forces to possible Russian resistance, Ankara's likely offensive into the area could even drag it into a dangerous conflict with the numerous other countries involved in Syria. America’s military leaders do not like to rock the boat. Whether testifying before Congress or writing in professional journals, our modern major generals, and the colonels and majors who dream of wearing stars on their collars one day, have been largely unwilling to criticize either the strategy or the tactics of our failed post-9/11 wars. Though there have been honorable exceptions, our combat leaders mostly keep their opinions to themselves, even in retirement. So we owe thanks to our oldest ally for boasting an officer with the moral courage to put himself in the line of fire back at home. Col. Francois-Regis Legrier, who leads the French artillery supporting Kurdish forces in Syria, recently excoriated the anti-ISIS coalition for its risk aversion and the resulting destruction of civilian areas. “Yes, the Battle of Hajin was won, at least on the ground, but by refusing ground engagement, we unnecessarily prolonged the conflict and thus contributed to increasing the number of casualties in the population,” Colonel Legrier wrote in France’s National Defense Review. Israel's April 9 general elections could potentially end the Benjamin Netanyahu era, ushering in new dynamics for the U.S.-Israeli relationship, the Israel-Gulf rapprochement and Israel's relationship with the Palestinians. But whoever leads the next Israeli government will still face rising tensions in Gaza, the West Bank and Syria that threaten to escalate into large-scale violence or even conflict between Israel and Iran. The next Israeli government will also have to contend with a less-friendly United States due to rising bipartisan concerns about Chinese-Israeli ties, as well as increasing skepticism of Israeli strategies among some Democrats in Congress. BEIRUT (Reuters) - The Kurdish-led administration that runs much of northern Syria welcomed a U.S. decision to keep 200 American troops in the country after a pullout, saying it would protect their region and may encourage European states to keep forces there too. “We evaluate the White House decision ... positively,” Abdulkarim Omar, co-chair of foreign relations in the region held by the U.S.-backed Syrian Democratic Forces, told Reuters. The White House announced the plans on Thursday to keep “a small peacekeeping force” in Syria, partly reversing a decision by President Donald Trump in December to pull out the entire 2,000-strong force. Trump’s abrupt announcement of the pullout had been opposed by senior aides including Defense Secretary Jim Mattis who quit in response, and stunned allies including the Kurdish-led SDF, which fought against Islamic State with U.S. backing for years. “This decision may encourage other European states, particularly our partners in the international coalition against terrorism, to keep forces in the region,” Omar added. A popular saying among Russian military historians is that “the AK-47 is a weapon of the proletariat” due to this automatic assault rifle’s extreme popularity with insurgent forces in regional conflicts around the world throughout most of the Cold War and beyond. Yet, the Syrian civil war has arguably seen the AK-47 be superseded by the unmanned aerial vehicle (UAV) as the latest indispensable tool of asymmetric warfare (Vpk-news.ru, January 16, 2018; see EDM, January 16, 17, 2018). In light of this reality, Russian has been cultivating its ability to utilize UAVs over the battlefield as well as working to develop its first unmanned combat aerial vehicle (UCAV) (see Part One, February 13, 2019). At the same time, Moscow seems to be experimenting with employing UAVs to bolster the Russian Armed Forces’ Network Centric Warfare (NCW) capabilities in addition to being able to use drones to disrupt the enemy’s NCW systems. Moreover, Russia is seeking to develop effective anti-UAVs capabilities as quickly as possible. Reportedly, it is practicing these skills mainly in the Southern Military District (SMD) and partner countries along Russia’s southern perimeter—apparently due to this area’s climactic and geographic similarities to Syria (see below). As the Syrian civil war grinds to an end, the government in Damascus, propped up by Iran and Russia, is regaining its footing, with important implications for the balance of power in the Middle East. Syria’s neighbors and powers outside the region are now attempting to determine the appropriate level of engagement, if any, to have with President Bashar al-Assad’s regime. 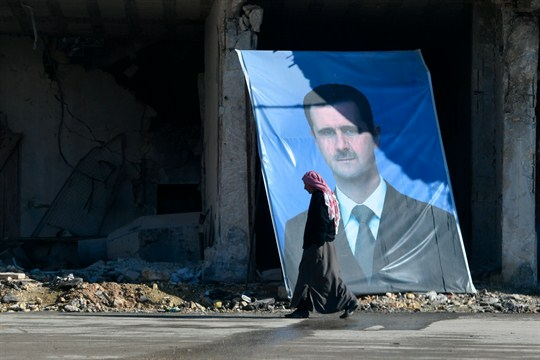 While Assad’s main foreign patrons will no doubt continue to deepen their military, political and economic ties, it is countries that stood against him over the past seven years that now have the most difficult decisions to make. If recent trends are any indication, it seems many of them are increasingly leaning toward at least some sort of engagement. The question is how to do this in a face-saving manner that doesn’t weaken their diplomatic and political standing, particularly after President Donald Trump’s abrupt decision to withdraw the 2,000 American troops in Syria. (FPRI) — Last week, the Wall Street Journal and Reuters reported that the United States military will begin to withdraw troops from northeastern Syria with the end of April as a “soft date” to finish the removal of most (if not all) of the 2,000 troops stationed there. In parallel, Ambassador James Jeffrey, the Special Representative for Syria, is engaged in negotiations with Turkey and the Syrian Democratic Forces (SDF), the Syrian Kurdish-led partner force that has borne the brunt of the U.S.-led ground war against the Islamic State, to try to manage the U.S withdrawal. After President Donald Trump announced in mid-December that the Islamic State had been defeated, the United States military has sought to catch-up with the president’s rhetoric and finish the fight against the small and sparsely populated Islamic State territory in a small sliver of eastern Syria.